Hello dear readers! We hope that you’re having a fantastic week so far? 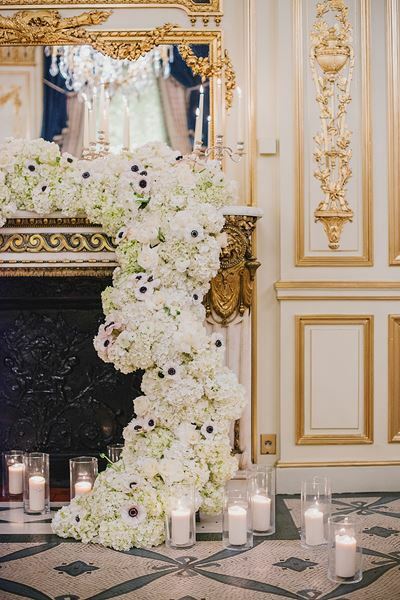 Today on the blog, we’re welcoming FWS Vendor Billy Folchetti from Luxe Paris Events who is going to talk about interfaith weddings, and in particular interfaith weddings in the city of love – Paris! Billy talks about the ways interfaith weddings bring extra decisions that need to be made, and how the key component is often to compromise. We all know the stress and anxiety a wedding can bring- planning, color palettes, traditions and the “to dos” and “not to dos.” When clients first approach us about planning their weddings and events the first thing I always say is just focus on actually saying “I do.” Throw everything else you think you need (or know) out the window- burn that wedding handbook! Traditions are something that families value of course but its also something that families create- why not make a few new ones as you begin to expand on your new family??? One place that we generally run into a “rough patch” while planning with this theory is when religion comes into play and especially when there is more than one. It is a touchy subject that must be addressed delicately especially when considering the older generations on each side. 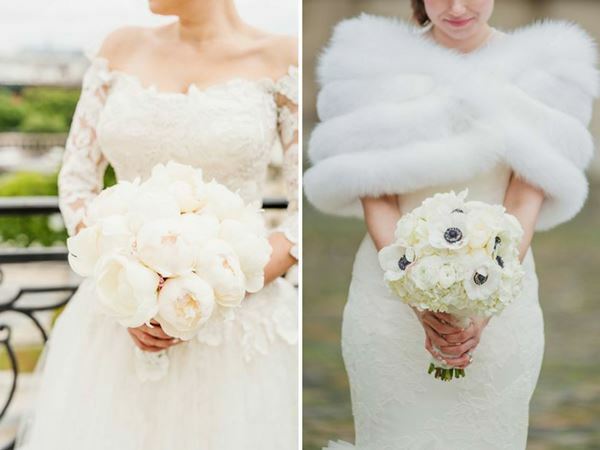 The first thing that comes to mind is compromise- between bride and groom first and then with the families. Take into account what everyone’s initial “wish list” looks like and see where the common points are- if everyone, for example, has a chuppah on the list then we can identify that as a “must,” and if not then maybe you skip it all together. When designing the event or the specific religious portion (commonly the ceremony) don’t forget to remember the actual significance of what is happening- a blending together of two lives and two different faiths which must be incorporated into the big day with balance. Thinking of ways to modernize it so that even if your incorporating something you may not “really want” doing it in a way that says “its here,” but its not perhaps a 100% obvious can be a nice approach and potentially appeals to all involved. 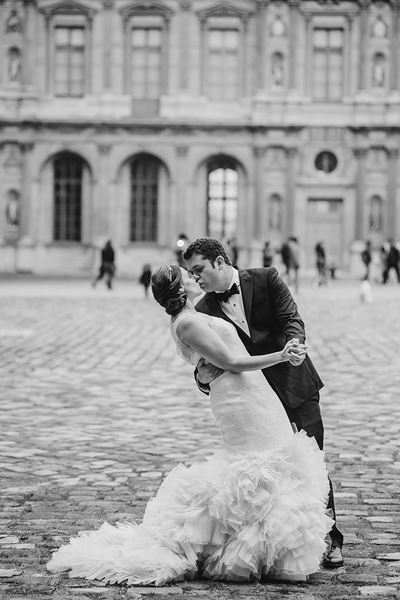 Last summer I planned a wedding for an American/French couple who live in New York- she was Jewish, he was not. 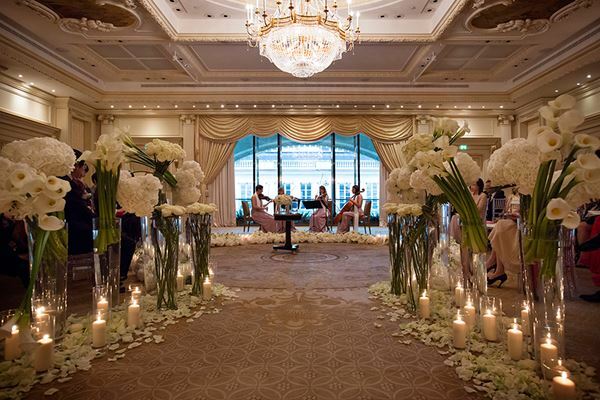 We made a wish list from all parts and decided that while the ceremony would be conducted by the families rabbi it would take place in a non-religious setting (a stunning 17th century ballroom at the Shangri La Hotel). The second item on everyone’s list was a chuppah. Rather than designing something that screamed “mazel tov” (even though we all did after the first kiss) we designed a structure that could serve as a chuppah but in reality was sort of a tent structure that even many non Jewish couples incorporate into their design- compromise! The beautiful union continues and their family growing when they welcome an interfaithed baby girl into the world this December. 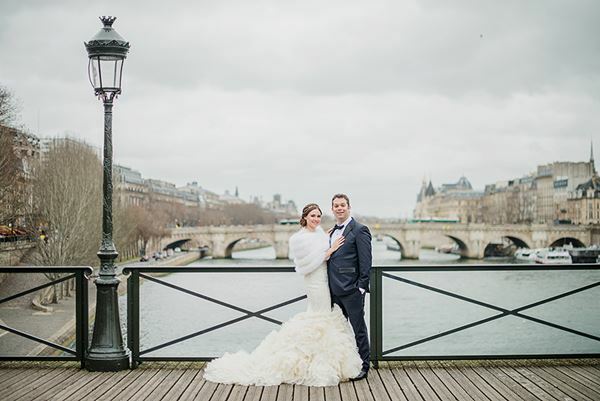 In 2016 at a beautiful winter wedding at Le Meurice in Paris we worked with a couple who split their faiths as well- He was jewish and she catholic. Both bride and groom in this case did not specifically want to incorporate religion in the ceremony but out of respect for both sets a parents we decided on another compromise. 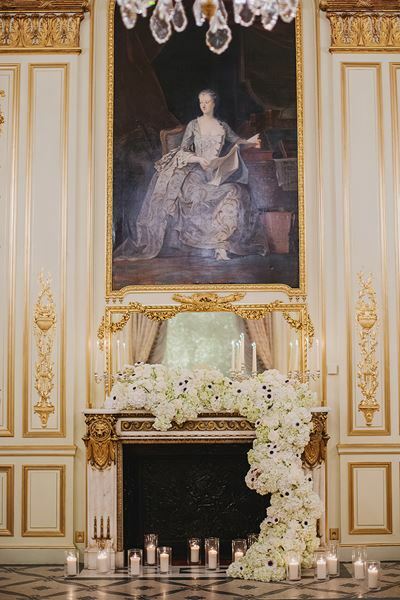 The ceremony was conducted by a non-affiliated celebrant (me) and during the ceremony we took a break for the bride and groom’s Mothers to make two separate readings that identified their own beliefs. By standing together while doing so they showed the mutual respect and appreciation for the other side- a symbolic compromise of two different beliefs living under the same roof with love and respect. At the end he stomped on a glass and then cheers’d out of one filled with champagne. They welcomed a beautiful baby boy into the world last year. 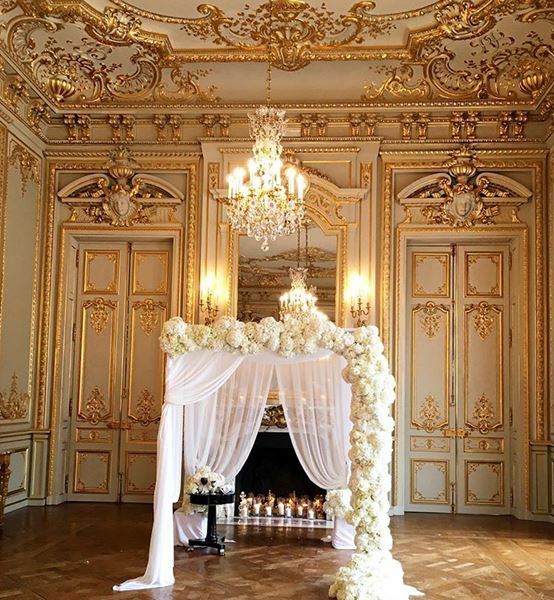 Also in 2016 we worked with a couple getting married at a chateau outside of Paris- this one was really interesting. The Persian bride, raised Jewish by parents of Muslim decent married an Egyptian Coptic Catholic groom. Rather than a traditional “aisle” or processional set up for the ceremony the couple fell in love with our idea of a circular set up. 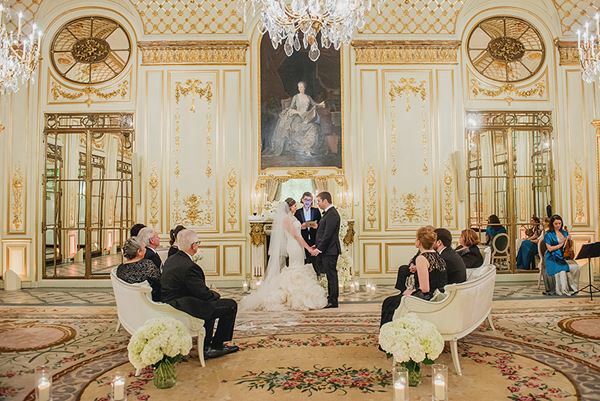 The chairs were formed in a circle where guests from both sides were intermixed. We left an opening at either side of the circle (almost like two half circles facing each other). As the music stared the Bride with her parents and the groom with his Mother entered the circle at the same time/from opposite sides and joined together in the center. They found themselves surrounded by a diverse crowd of their nearest and dearest full of love and support as they looked in at the couple saying “i do.” Performing the ceremony was the bride’s uncle- in his delivery he made it a point to discuss the difference between the two and how special the union was… without getting too specific he made sure to address how beautiful and unique it can be when opposites attract. The couple still has no baby plans (contrary to the bride’s Mothers multiple requests) but they did just buy a home in the Hamptons to welcome and host their diversified group of loved ones all together! In the end the choice of “whats in” and “whats out” is a personal. However going about it in a way that reflects the true spirit of “love is love” with balance, appreciation and love for both sides forms a foundation for a relationship and a life together that will last.